Laurel Villa Dental now offers non-surgical facial treatments. These include Botox Azzalure and Dermal Fillers. This well established treatment can prevent, reduce and even remove fine lines and wrinkles on the forehead and around the eyes. It works by reducing the effect of facial muscles on the skin, which can lead to line formation over time. Following your free consultation, the ‘areas’ requiring treatment can be highlighted and a quote can be provided. At Laurel Villa we use a product called Azzalure. The solution is injected using fine needles and can take 1-2 weeks for full effect. Precise dosing will achieve a more natural result. We review after 2 weeks. The effects lasts between 3-6 months. Re-treatment is then required as lines and wrinkles begin to reappear. 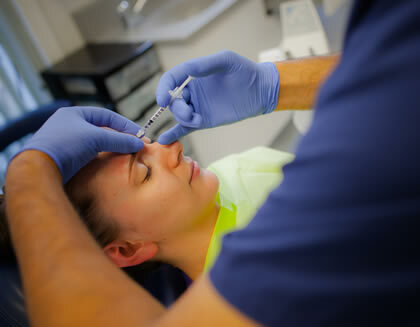 Dermal Fillers are used to remove or reduce lines, folds and wrinkles on any area of the face. They are mainly used around the nose and mouth. Fillers are based on hyaluronic acid, which is found naturally in skin. This molecule provides elasticity. As we age it degrades and wrinkles/folds form as skin loses tension. Following your free consultation, the areas to be treated can be highlighted and a quote provided. Fillers are injected using fine needles and massaged under the skin. The effects are immediate and the appearance improves even more so over a couple of days. On average, fillers can last around 12 months. Increasingly, fillers are also used in the lips to provide definition and fullness. We use Juvederm and Emmervel at the practice.